After the Star Wars explosion of the late 70's, licensing dynamo Mego wasn't going to be bested again. 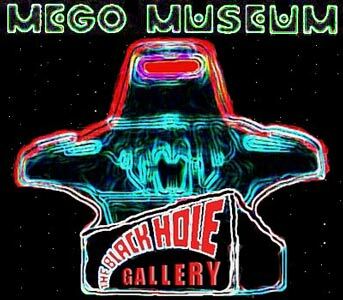 They backed any sci-fi project in the works, including Star Trek, Logans Run, Buck Rogers and Disney's the Black Hole. 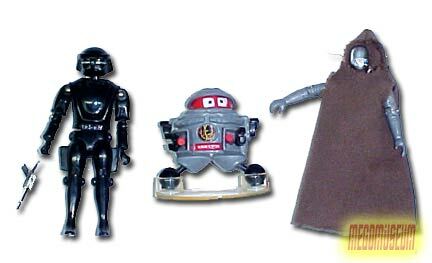 The film was nowhere near as popular Star Wars (though probably just as expensive), but it left a pile of high quality merchandising from Mego. It sold poorly and was ended abruptly, creating a number of rarities. 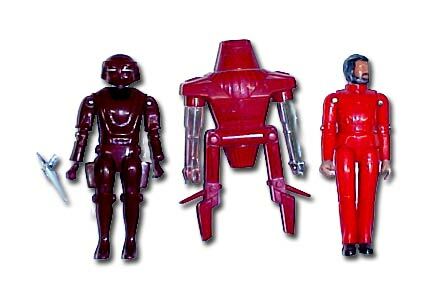 One of the toylines biggest failures was its reliance on the human characters over the robots. Old B.O.B was easily more popular than any human character, but he wasn't in the first wave. 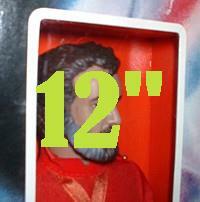 The 3 3/4 " line was extremely well made, utilising figure knowledge gleaned from Takara and Mego Micronauts. 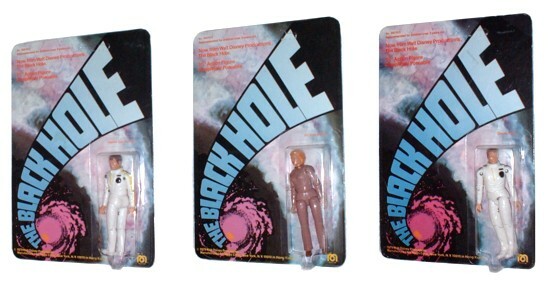 Mego made the Black Hole figures above industry standard with amazing articulation. Dr Kate, Dr. Durant, Charlie Pizer, Dan Holland, and Harry Booth. Sentry, Maximillion, and Reinhardt; the baddies. The "Big Three" were blown away in Canadian Sears and K-Mart outlets for $1.00, probably the three best figures in the series. 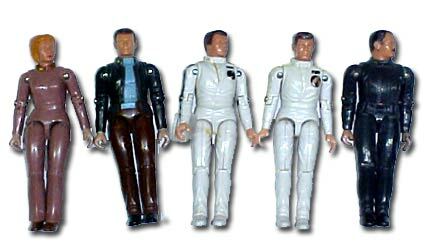 It's a shame Mego released them last. Carded Humans courtesy of Michael Farence. Carded Robots courtesy of Michael Farence. 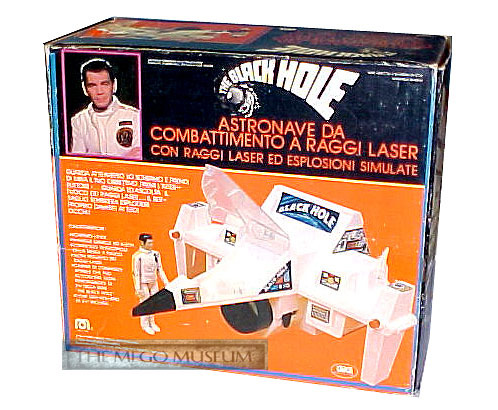 In Italy, Gig repackaged the Mego Buck Rogers Laser Scope and gave you a free Captain Holland. 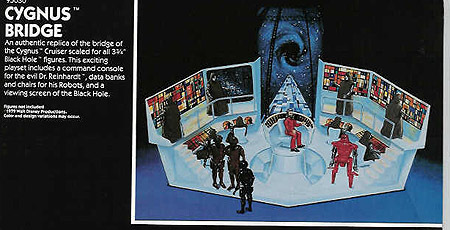 Unproduced Black Hole Cygnus playset utilized the Vacuform style playset that Mego was doing in the late 70's much like the Mego Buck Rogers Space Port and Mego Pocket Heroes Batcave. The Cygnus was also pitched as a vinyl playcase. 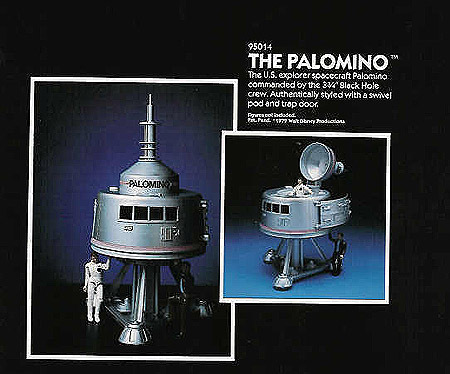 As a fan of the Black Hole, it often bothers me this was never made. I think 10 year old Brian would have loved it to death. The prototype for this piece apparently showed up in Italy.